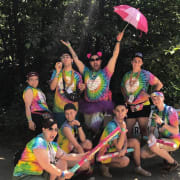 Camp Brave Trails, leadership camp for LGBTQ teens, is looking for awesome role models to serve as Cabin Counselors! Cabin Counselor are volunteers who give their time for one or two weeks in exchange for room, board, and the opportunity to changing lives! Counselors have one of the most important jobs at camp as they will be spending the most time with the campers. You and your fellow co-counselors will be responsible for the well-being of the campers in your cabin. Your attitude, enthusiasm, passion, and participation will shape the positive experiences your campers will have at camp. As a cabin counselor, your role is to supervise campers, insure their mental and physical wellbeing, and make everyone feels supported. You will also facilitate icebreakers, conversation, and fun cabin activities! This experience will be tons of fun, at times difficult, but ultimately extremely rewarding! Brave Trails senior staff will be here to support you every step of the way. If you have lots of energy, a positive attitude, are not afraid to sing camp songs or dress up in silly outfit, enjoy working with youth and have worked with youth before, apply! 2) Complete the Volunteer Application & Interview. 3) Must pass a government issued fingerprint clearance test and criminal background check. 4) MUST be able to attend the mandatory pre-camp training and the full camp session. Mandatory Training. 5) Understand this is a volunteer commitment. You will not be compensated for your travel to and from camp or time. Room and board will be covered by Camp Brave Trails. Strong knowledge of LGBTQ vocabulary, Clean Background Check, LOTS of positive energy!